Jo Farris bases her paintings on layering form with overlapping imagery. Classically trained, her paintings retain familiar subject manner in an abstracted tradition. She explores a complex interplay of method...dense surface texture, hard edge and organic passages, bold color balances areas of subtleties...to explore a world in flux, in opposites with the human condition. ​Cities have always had a pulse for Jo. 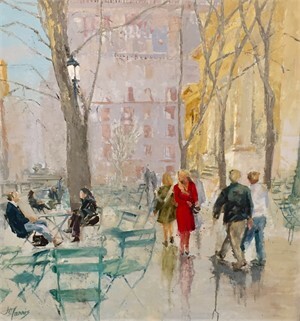 The sights and sounds give this artist the narrative to paint them with bold colors of brilliant days to the subtle grays of rainy afternoons. As a child she was fortunate to travel widely across the country exploring these great cities. Her classical education at Mississippi State College for Women combined with the expressionistic style of the University of South Alabama has served her well bridging these styles. ​Skyscrapers that pierce the sky can be seen merging into the dense paint. 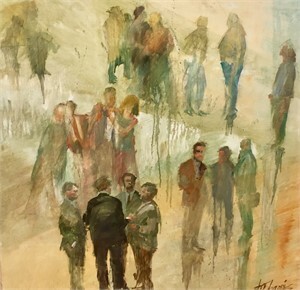 Gestural brushwork captures a glimpse of figures swirling through their day. She accurately records the underpinnings of each city giving the stability that awaits her palette knife. ​She frequently explains her work as a collaboration of "paint and destroy". This gives her paintings their edginess with rhythm and movement upon lush thick surfaces....an authenticity without explicit definition. 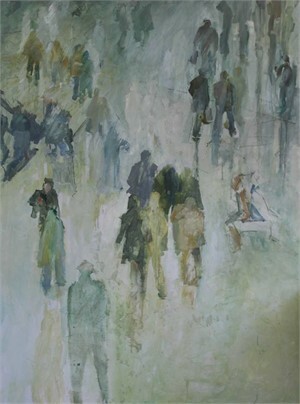 As a resident of Georgia for over thirty years she continues to find far ranging landscapes from the blue mountains through urban compact to the coastal flatlands provide the visual vocabulary for her work. The basis for this work is from the root to branch. Modular, encapsulated areas in her paintings explore the various conditions of this contemporary life. This recent work has received high praise from the private sector and corporate alike. Jo Farris bases her paintings on layering form with overlapping imagery. Classically trained, her paintings retain familiar subject manner in an abstracted tradition. She explores a complex interplay of method...dense surface texture, hard edge and organic passages, bold color balances areas of subtleties...to explore a world in flux, in opposites with the human condition. ​Cities have always had a pulse for Jo. 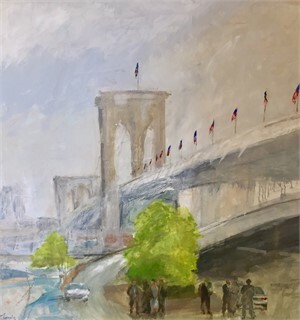 The sights and sounds give this artist the narrative to paint them with bold colors of brilliant days to the subtle grays of rainy afternoons. As a child she was fortunate to travel widely across the country exploring these great cities. Her classical education at Mississippi State College for Women combined with the expressionistic style of the University of South Alabama has served her well bridging these styles. ​Skyscrapers that pierce the sky can be seen merging into the dense paint. 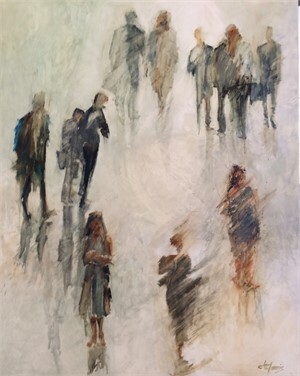 Gestural brushwork captures a glimpse of figures swirling through their day. 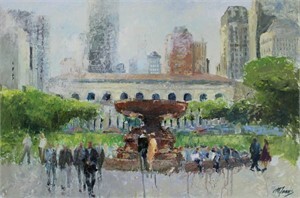 She accurately records the underpinnings of each city giving the stability that awaits her palette knife. ​She frequently explains her work as a collaboration of "paint and destroy". This gives her paintings their edginess with rhythm and movement upon lush thick surfaces....an authenticity without explicit definition. 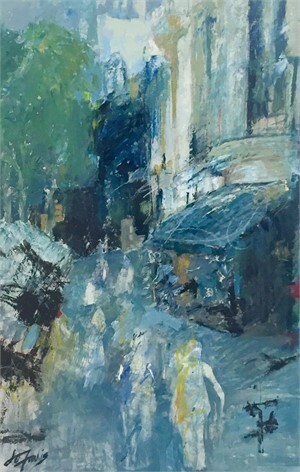 As a resident of Georgia for over thirty years she continues to find far ranging landscapes from the blue mountains through urban compact to the coastal flatlands provide the visual vocabulary for her work. The basis for this work is from the root to branch. 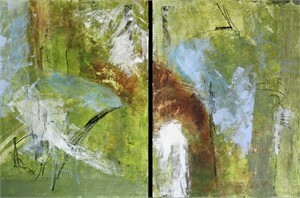 Modular, encapsulated areas in her paintings explore the various conditions of this contemporary life. This recent work has received high praise from the private sector and corporate alike.